Properties & Taste: Bitter, sour and slightly cold. Functions: 1. To nourish blood and consolidate the yin; 2. To pacify the liver and stop pain; 3. To soothe liver yang. 1. Deficiency of blood manifested as irregular menstruation, dysmenorrhea and uterine bleeding. White peony root (Baishao) is used with Prepared rehmannia root (Shudihuang), Chinese angelica root (Danggui) and Chuanxiong rhizome (Chuanxiong) in the formula Siwu Tang. 2. Deficient blood and yin leading to the yang floating to the surface manifested as night sweating and spontaneous sweating. White peony root (Baishao) is used with Oyster shell (Muli), Dragon's bone (Longgu) and Light wheat (Fuxiaomai). 3. Weakness of the body due to invasion by exogenous pathogenic wind and cold manifested as spontaneous sweating and aversion to wind. White peony root (Baishao) is used with Cinnamon twigs (Guizhi) in the formula Guizhi Tang. 4. Liver qi stagnation manifested as hypochondriac pain, breast distension and irregular menstruation. White peony root (Baishao) is used with Bupleurum root (Chaihu) and Chinese angelica root (Danggui) in the formula Xiaoyao San. 5. Muscle spasms and pain of hands and feet or abdominal pain. 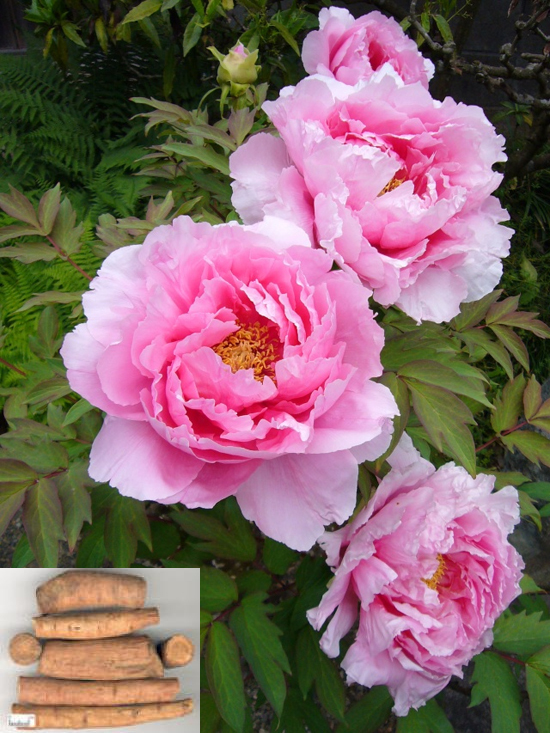 White peony root (Baishao) is used with Licorice root (Gancao). 6. Abdominal pain and tenesmus in dysentery. White peony root (Baishao) is used with Costus root (Muxiang), Coptis root (Huanglian) and Bitter orange (Zhiqiao). 7. Headache and dizziness caused by hyperactivity of liver yang. White peony root (Baishao) is used with Uncaria stem (Gouteng), Cyathula root (Niuxi) and Chrysanthemum flower (Juhua). Dosage: 5-10 g or 15–30 g, for a large dosage, decocted in water, and taken internally.